I’ve been wanting to have a go at making Cinnamon Scrolls for what feels like FOREVER and with Mother’s Day coming up I decided now was as good a time as any to finally give them a try – after all there will be no fancy breakfast in bed for me unless I make it myself! In the interests of saving time, I decided to use my fail safe scroll dough recipe – the same one I used for my Vegemite and Cheese Scrolls and Nutella and Raspberry Scrolls to create these yummy and most importantly yeast free Cinnamon Scrolls. 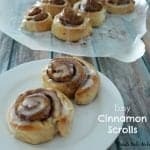 Now I’m going to give you a warning before you read this recipe, these scrolls are most certainly a sometimes food and cannot be considered healthy in any shape or form. Thanks to the combination of a thick and generous butter, sugar and cinnamon filling is complemented perfectly by the soft scroll dough and sweet vanilla icing you only need one (ok maybe two) to satisfy you – but if you eat these warm I dare you to stop at just one. Preheat the oven to 210 degrees and line an oven tray with baking paper. Sift the flour and salt together in a large bowl before rubbing in the butter until the mixture is the consistency of bread crumbs. Spread the softened butter over the dough, leaving a 2cm gap around the edges. Combine the cinnamon and sugar in a small bowl and sprinkle generously over the top of the butter. Starting at the long side carefully roll the dough until enclosed. Place on a baking tray, making sure you leave enough room to rise. Bake in oven for 20 minutes or until golden brown on top and cooked through. Let the Cinnamon Scrolls cool on the tray for 5 minutes. In the meantime, combine the icing sugar, boiling water and vanilla extract to make the icing. Drizzle the icing over the top of the still warm scrolls. Allow the Cinnamon Scrolls to cool for a further 5 minutes and enjoy! 1. Preheat your oven to 210 degrees and line a baking tray with baking paper. 4. Use the kneading function to knead the dough for 2 minutes. 6. Spread the softened butter all over the dough, leaving a 2cm gap around the edges. 7. Combine the caster sugar and cinnamon before sprinkling over the top of the butter. 8. Starting at the long side, carefully roll the dough until enclosed. 9. Cut into 12 slices – approximately 2cm thick. 10. Place on a baking tray – make sure to leave enough room for the scrolls to rise. 11. Bake in oven for 20 minutes or until golden brown on top and cooked through. 12. Let the scrolls cool on the tray for five minutes while you make the Vanilla Icing by combining the icing sugar, boiling water and vanilla extract. 13. 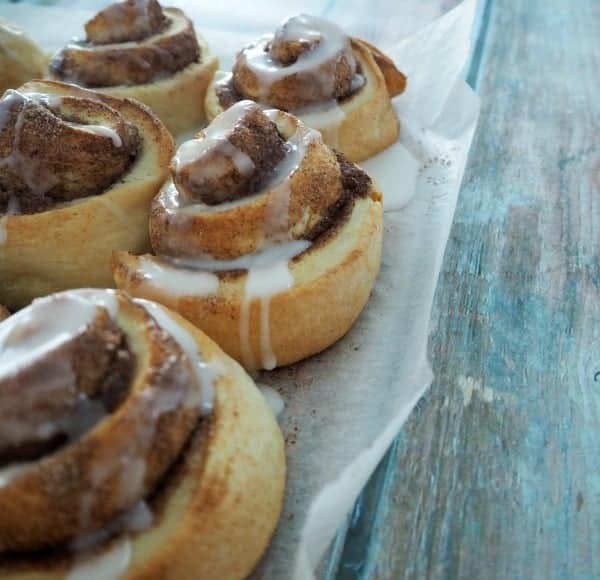 Drizzle the Vanilla icing over the top of the Cinnamon Scrolls before letting them cool for a further five minutes. These little beauties would make the perfect treat for a lazy Mother’s Day breakfast or brunch and because they are yeast free, it takes no time at all to put them together and pop them in the oven before you can sit down and enjoy them. I cannot believe I have waited so long to make these, the smell of the freshly baked scrolls coming out of the oven was so irresistible I actually burnt my fingers in an attempt to steal just a little piece before they had cooled. Is there a recipe you have been wanting to make for ages but just haven’t gotten around to yet? Lauren I so love that there is no yeast rising fancy pants steps required fro these little treasures. You will love them Dannielle, enjoy! I love cinnamon – it’s my favourite flavour! And that video – you deserve an Oscar! haha, you are too kind! Happy Fabulous Foodie Fridays gorgeous lady! I’m thinking those cinnamon scrolls of yours may just have to star a role at our Mother’s day brunch. I have wanted to make these for ages too. Love your little video. I must try and schedule this recipe in sometime soon! I hope you enjoy them Malinda, they are so good! These look so good Lauren. I must try them too. Oh they look amazing! I’ve been wanting to make cinnamon scrolls and Mothers Day really is the perfect excuse. Yum. I love that you’ve included a recipe for the plebs like me who don’t own a thermomix (cough). You had me at yeast free! Have been wanting to make cinnamon rolls forever now I’ve found a great easy recipe. Do you think i can make the dough the night before and bake in the morning? I haven’t tried doing it that way before, If you kept it covered it should be ok though. Hi Jayne, That’s so good that you all enjoyed them, you’ve made my day! Hi Linda, I’m sorry to hear it didn’t work out for you. I would suggest adding a little extra milk if your mixture was breaking up/crumbly. If you cut the long roll with scissors 3 quarters down vertically about 2cm apart and then push the flaps left then right etc. and then cook it, it becomes a cinnamon braid!